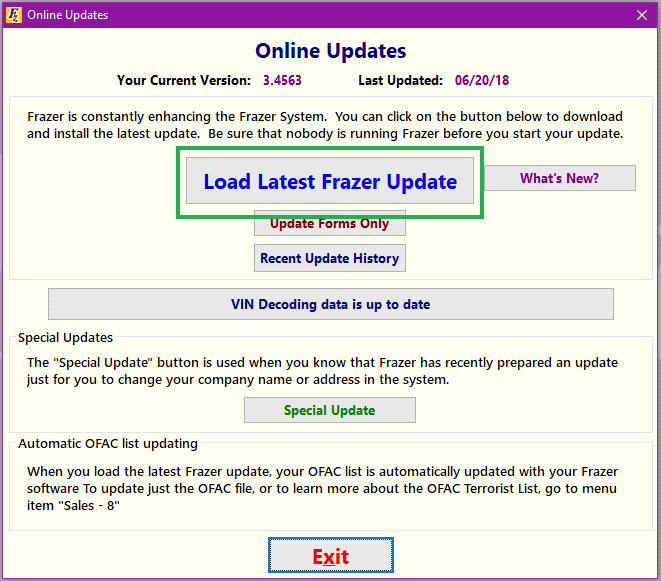 Version updates for the Frazer DMS program are released on a weekly basis but are not automatic. The program may be manually updated* anytime by clicking Updates along the top of Frazer. *An internet connection is required and version updates MUST be done from the main server computer for Frazer. 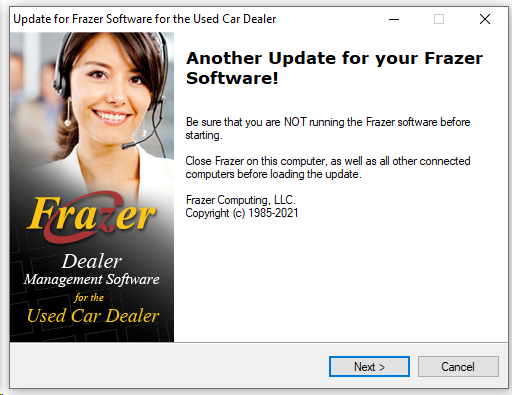 All sub-windows should be closed in the program and Frazer should be closed on all workstation computers. All version updates include the latest version of the OFAC (Office of Foreign Assets Control) Specially Designated Nationals and Blocked Persons Database. To load the most recent Frazer update, click on Updates at the top of Frazer. Then click Load Latest Frazer Update. The update file will begin downloading. 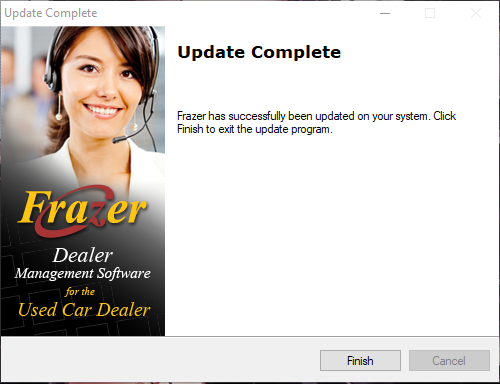 Once the download has completed, Frazer will close and the installation screen will appear. 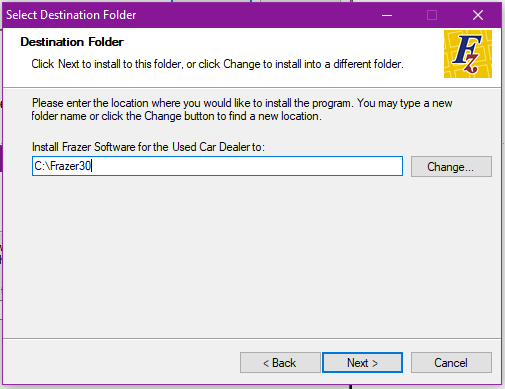 On the following screen, the installation program will default to where the Frazer program is. Be sure that the destination folder shown is correct, then click ‘Next’. 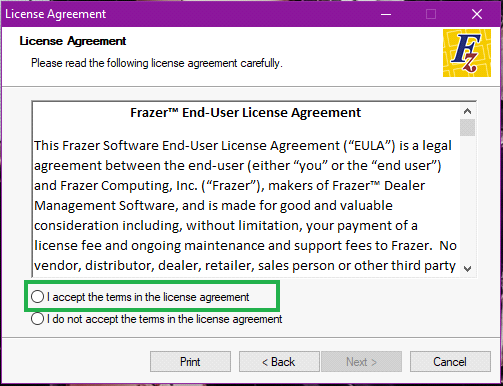 The Frazer End-User License Agreement (EULA) will display. Accept the agreement to continue. After accepting the agreement and clicking Next, the installation will finish up and Frazer will close. After a few moments, Frazer will reopen to update several data files. When this is complete, Frazer will close again, and the update is finished. Frazer may open and then close numerous times during this process. Once the update is finished, Frazer will close and you’ll see the following screen. You may run into errors/issues during when Updating. 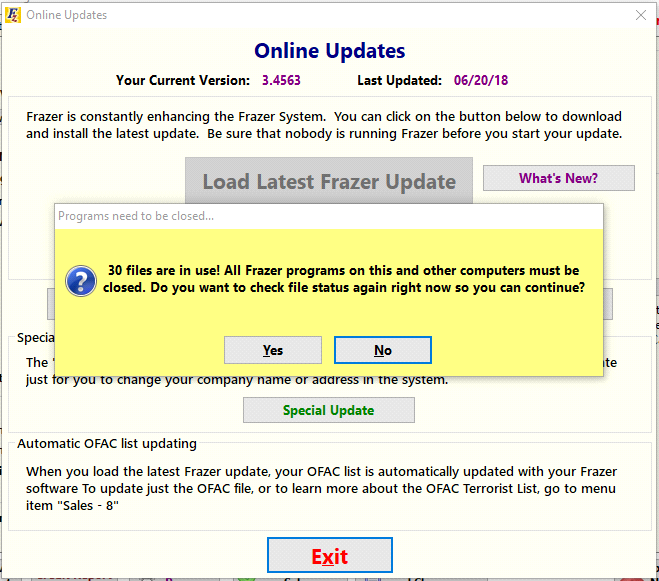 If Frazer is open on any workstation computers or if sub-windows are open when you begin an update, a warning will appear to indicate that the program is in use. Be sure that the program is not open or minimized on any workstation computers. If the program is closed, but the message still appears, restart the main computer and run the update again. In addition, Local Firewall Settings and Proxies could prevent Frazer from accessing the internet, and affect certain aspects of the program. If you suspect this may be the case, have your local technician check your network and internet settings.